WW1 Reenactments Equipment : Great War Tommy WW1 Documents, Paperwork : Boxed Set of Reproduced WW1 Memorabilia. WW1 Reproductions and WW1 Reenactors Equipment / Kit - Boxed Set of Reproduced WW1 Memorabilia. Boxed Set of Reproduced WW1 Memorabilia. 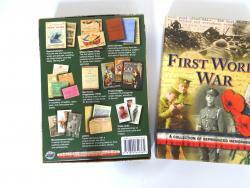 A boxed collection by the Memorabilia Pack Company of dozens of reproduced WW1 documents - Magazines, Wipers Times. Home Front, Letters & Active Service items. Fascinating! ideal for KS 3 & 4.